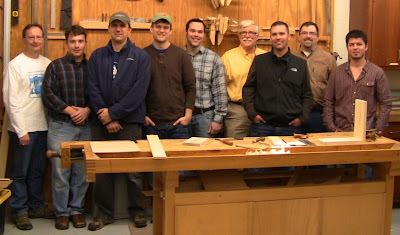 The MWA group in the bench room at Fine Woodworking. From left, me, Nick Roulleau, Dyami Plotke, Mike Morton, Michael McCoy, Doug Plotke, Chris Adkins, Jim Ashley, and Freddie Ellis. Photo by Matt Kenney. 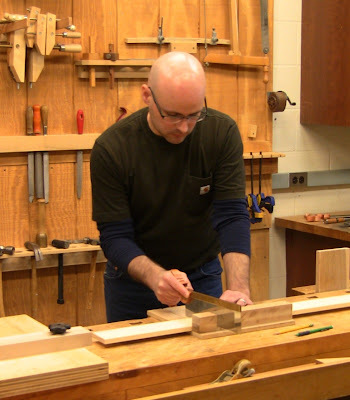 Dyami Plotke, of the Modern Woodworkers Association, recently contacted Matt Kenney, senior editor of Fine Woodworking, about doing a blog post on the magazine's shop. Matt very graciously invited him to bring a few of his fellow MWA members for a visit. 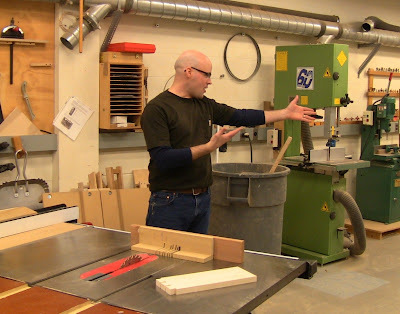 Friday, nine of us converged on the Fine Woodworking offices in Newtown, CT, where Matt and art director Mike Pekovich discussed the process of putting together an issue, then gave us a shop tour and demos on methods for streamlining shop efficiency. Dyami will be doing a post with video on his blog, The Penultimate Woodshop, in a few days, so I'll just do a quick summary here. 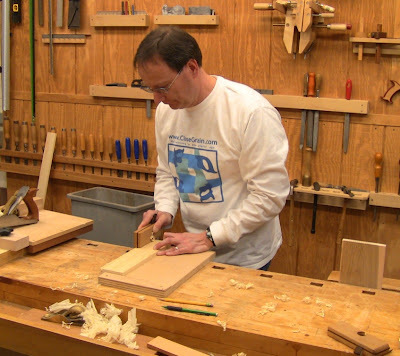 The MWA is a new woodworking organization of professionals and hobbyists. The "modern" part refers not specifically to anything about woodworking, but to the fact that the Internet provides us a modern medium for participation and communication. These are people who have met online through forums, blogs, and social media sites, and occasionally get to meet in person. Join in; you've probably already bumped into some of these folks online! 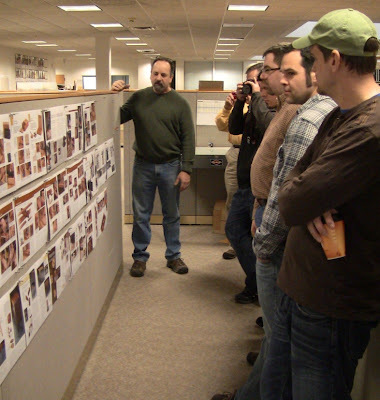 Mike Pekovich shows us the final layout of the April, 2012 issue, pinned to the aisle wall. Everyone in the office gets to walk by and critique it for a few weeks, checking for errors, layout problems, and overall flow. Matt and Mike started the day by talking about the separation between editorial and advertising departments. Matt went through the process of working with authors to bring articles to press. 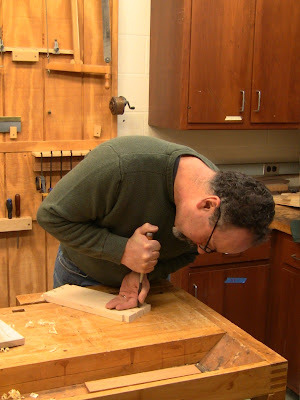 Fine Woodworking is a reader-written magazine (you can find their author guidelines here), and many of the authors are extremely busy. He works with them to refine story ideas, write copy, and take photos. He said the magazine may work with nearly 100 authors a year, ranging from world-renowned experts to hobbyists. Space limitations prevent them from showing every step of a project, so they have to find the unique essence to emphasize in an article. For project articles, they have to assume readers are familiar with specific techniques, but then they'll periodically publish technique articles to make sure that information doesn't get overlooked. They have to find a balance for a varied readership. The Internet helps out with this by allowing them to provide extra content on their website. Matt discusses several tools in the machine room. They try to make sure they have the same types of tools that their readers have (though the aircraft-carrier of a jointer not shown in the photo is probably stretching what most shops have!). Matt said all the tools in their shop are purchased. They don't accept anything free from any manufacturer, whether it's a large company or a mom-and-pop operation, because they want to avoid any perception of influence or favoritism. Anything provided by manufacturers for evaluation is sent back once the evaluation is complete. For shop demos, Matt started off in the bench room, showing his hand tool pipeline for working on parts for boxes. Matt cuts a piece to rough length on the bench hook before shooting it to precise length with the shooting board on the left. Matt showed us the dedicated grooving planes he made and asked if anyone would like to try them, so I did. The nice thing about a dedicated tool is that you don't have to fiddle with any adjustments for width or depth, you just go. And of course that's how you end up owning dozens of specialized molding planes! Next Mike showed us a hybrid tails-first technique for dovetailing. In another variation on the theme of dedicated tools, he has a specially-ground blade mounted on his table saw. The tooth edge is ground to 9.5 degrees (which he said can be done for about $25), then the blade is canted to that same angle. The result is that the top of the cut forms the dovetail shoulder straight across, while the side forms the angled dovetail side. 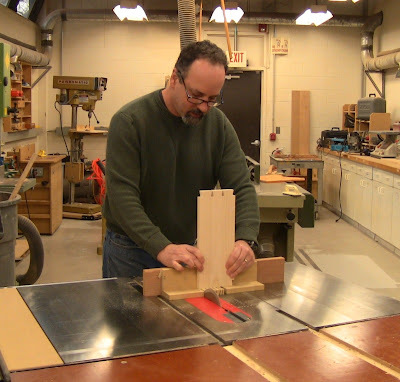 Using a simple sled on the saw's miter gauge, Mike nibbles the dovetail sides away. 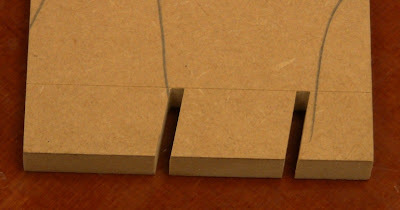 This close-up of a test scrap of MDF show how the custom-ground blade forms the straight shoulders. This piece can also be used as a setup gauge for resetting the blade angle. ...followed by paring to the baseline with a chisel. Given these precisely-formed tails, the pins can be easily cut by hand on the mating piece. Over lunch, Matt asked if we had any suggestions for improving the magazine. Simultaneously, three of us all said some version of "More!". 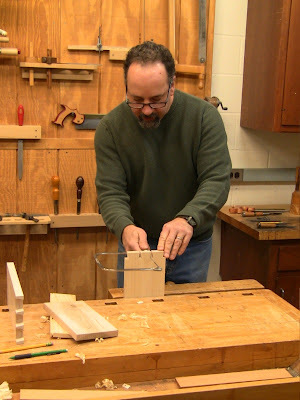 I also told Mike I was happy to see the magazine engaging with people; in fact, I had met him briefly last year at the Woodworking Show in Springfield, and I had met Matt a couple times before at Lie-Nielsen hand tool events at Phil Lowe's school. Big thank you's to Dyami Plotke for arranging the visit, and to Matt Kenney and Mike Pekovich for spending their time with us! Great post. You certainly captured the essence and details of the trip. It was great to hang out with you, the other MWA guys & the Fine Woodworking folk. I'm hoping our meet up at Woodaexpo next weekend is just as great. Wow great blog.Great wood works done here.Thanks to post great blog.